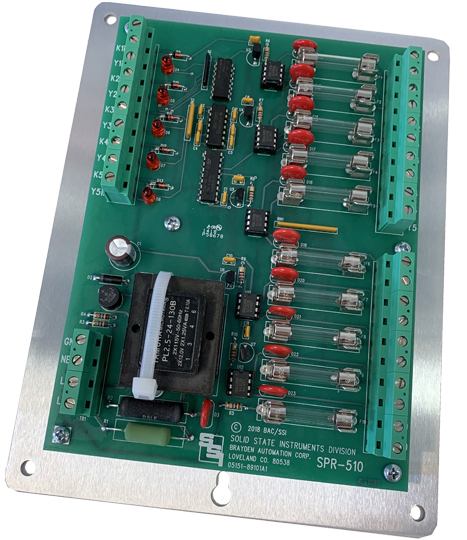 The SPR-510 is a 5-channel pulse isolation relay designed for high-density pulse applications where up to five RPR-2PS or SPR-2 relays would be required. Ten isolated solid-state Form A (K &Y) dry-contact outputs are provided, two each from five Form A inputs. The SPR-510 relay contains standard-duty solid state outputs. The wetting voltage provided by the SPR-510 to the sending devices (typically electric meters) is +13 VDC. 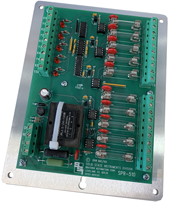 The SPR-510 may be used with meters having high or low voltage semiconductor outputs, or electro-mechanical output contacts (relays). The SPR-510 relay’s Form A inputs feature input filtering circuitry to prevent noise from false triggering the outputs. Pulses less than 18 mS are considered to be noise and will not be detected as a valid pulse. Once an input pulse, greater in length than 18 mS, is detected the corresponding outputs will be changed to match the state of the input. Bright red and green LED indicators display the system’s status at all times, thus allowing a rapid check of the system’s performance without requiring any additional test equipment. The SPR-510’s input and output terminal strip is a “Euro” type. When the stripped wire has been correctly installed in the terminal’s slot, no conductive parts are exposed on the surface of the terminal strip, thus allowing the user maximum protection from accidental electrical shock. The “K” lead of the SPR-510’s outputs are fused to prevent damage to the relays under almost any condition a user might cause such as excessive current, incorrect wiring, etc. The SPR-510 has built-in MOV transient protection for the solid state relay contacts that eliminates the need for external protection. The SPR-510 is normally mounted inside another enclosure, suitable for the user’s intended application. An optional NEMA 4X enclosure is available with the SPR-510 mounted on an internal mounting plate. Pulse Input: Five Form A (K & Y) inputs. “Kin” is common return. Input has “Yin” input terminals “pulled up” to +13VDC for pulse signal from meter. 125 VDC input using the DCS-1 Power Supply. Contact factory for other input voltages.